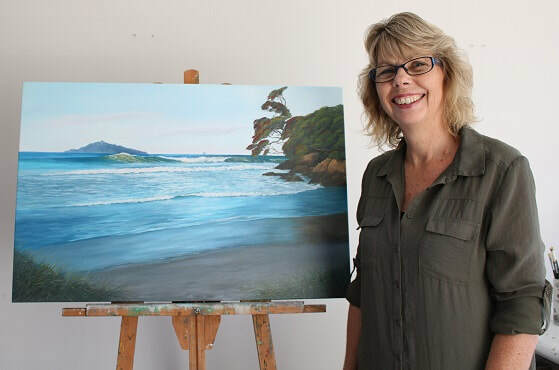 ﻿Leslie Cleary loves to create paintings that enable people to continuously enjoy their favourite NZ coastal landscapes. Specialising in commissions, she paints scenes from dawn to dusk of clients’ favourite views from images taken of the area. Working closely with Leslie, the clients get to choose the colours and size best suited for the room in which the painting will be displayed. Leslie ensures they get the best possible result – an amazing piece of art that they will treasure forever. Her commission work costs no more than buying from a gallery wall. Visitors are most welcome to my Whangarei home-based studio and gallery by appointment. It is in Church Street, Onerahi, a 2 minute drive from Whangarei Airport. If you have any questions, would like to enquire about paintings, limited edition prints, a special commission piece, or would like to visit please phone, message or email, I will get back to you as soon as possible.